You’re probably familiar with Meat Free Monday – every week people across the globe start the week meat-less, for the sake of their own health and that of the planet. Although an admirable initiative it’s really only a small step forwards in reducing our reliance on meat. So how much meat do I eat? After gradually reducing the meat in my diet my goal is for 5 days a week to be meat free. This inevitably impacts my husband, as I do most of the meal planning. After being raised in a strict Indian vegetarian household he rebelled and soon turned into a meat lover. But thankfully he’s with me on my ‘meat as a treat’ journey. Speaking of India I read today that there’s over 600 million vegetarians in India. With such mouth-watering food on offer vegetarian Indians probably don’t even think about meat. If I could work such magic with vegetables and spices I too would happily choose a vegetarian curry, dal or biryani over a fillet steak or pork chop. That’s why I’m turning my experimentation in the kitchen to Indian vegetable dishes. 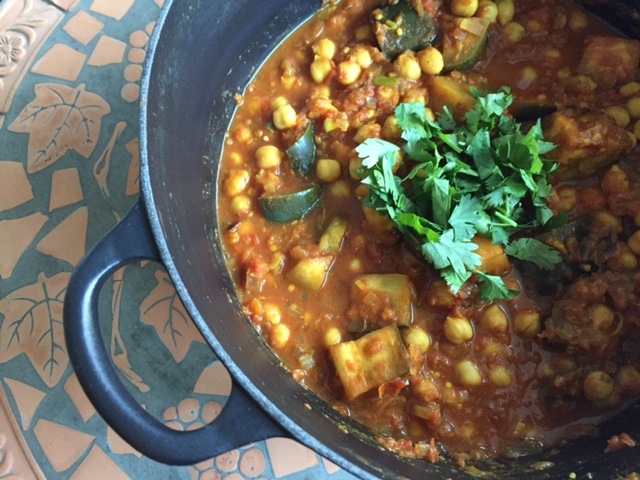 Here, in the first of what I hope to be a series of posts, I’m sharing a simple curry – chana masala. 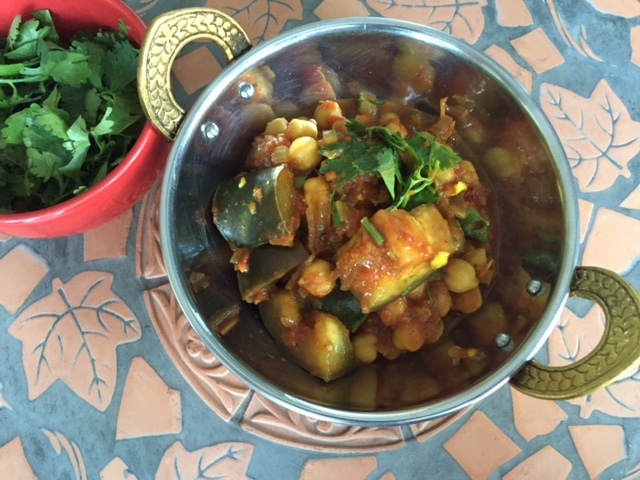 It comes direct from my favourite Indian cookbook – Rick Stein’s India, with just a few tweaks here and there, like adding eggplant. Tip – If you have time (and enough spices) make your own garam masala spice blend – it last for weeks and is so much fresher than anything store bought. For tinned chickpeas simply open the tin and drain the chickpeas. Be sure to keep the water in the tin – the chickpea juice. For dried chickpeas drain them from the soaking water, and add to a pan of boiling water. Cook for 30 minutes or so until soft, then drain and reserve 250ml of the cooking water – the chickpea juice. Heat the ghee or oil in a pan over a medium heat, then cook the onion for 10-15 minutes until soft. Pound the garlic, ginger and chillies in a pestle and mortar – or blitz into a paste with a hand blender. Add the garlic/ginger/chilli paste to the pan once the onions are soft and cook for one minute. Then add the cumin, coriander and turmeric and fry for another 30 seconds. Stir in the tomatoes, salt and chickpea juice. Also add the cubed eggplant. Bring to the boil and reduce to a simmer for 10 minutes. Add the chickpeas and cook for another 15 minutes. Before serving stir through the garam masala and lemon juice. Variations – add spinach or sweet potato in place of the eggplant. 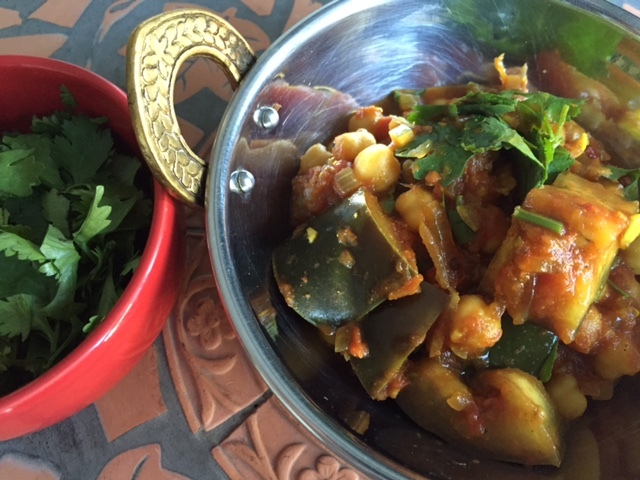 Tags: chana masala, chickpeas, curry, Indian, recipe. Bookmark the permalink. Agree Elaine – I never tire of it either…. Does your other half cook for you? Yes every Friday Elaine when he works from home…. Thanks Linda! Yes my husband is my biggest obstacle too – I’ll try to keep you inspired with my next few veggie posts! Yum, looks like a delicious combination! Wow flavorsome curry with lovely combo. ..